Termidor, short for Termidor SC (suspended concentration), most often serves as a subterranean termiticide application. Occasionally it's applied to kill ants. Although it works well when applied to underground areas, Termidor is not recommended as a termite killer indoors. 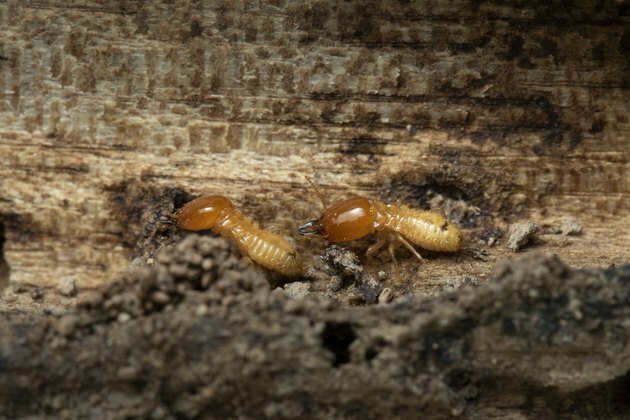 For drywood termites inside your home, opt for a nontoxic wood treatment like borate rather than Termidor. The active ingredient in Termidor is a chemical called fipronil, which works by blocking receptors in the brains and nervous systems of living organisms. The substance is toxic to people and pets, and the only difference between the products available to homeowners and professionals is the quantity in which it's sold. Don't assume fipronil or any other pesticide sold to homeowners is safer or less toxic than its commercial counterpart. Fipronil's LD50 rating is 177, meaning it requires 177 milligrams per kilogram of body weight to kill 50 percent of laboratory animals exposed to it. The level of exposure that causes an observable effect in laboratory animals is a much lower 5 milligrams per kilogram, so even small amounts can cause headache, nausea, dizziness and weakness. Children and small animals can be harmed or killed by much smaller amounts of fipronil than a healthy adult. Children are more sensitive to pesticides in general, as their systems are still developing and they are less able to safely process poisons out of their bodies. Small animals may show such symptoms as irritation, lethargy, uncoordinated movement and convulsions from overexposure to fipronil. Fipronil can also disrupt thyroid function and causes thyroid cancer in rats at doses of 300 parts per million. Take great care when mixing and using Termidor. Always wear long sleeves, pants, nonabsorbent gloves, eye protection and a mask when working with Termidor or other poisons. This is not the time for children or pets to romp in the yard, so make sure they stay safely indoors while you're working. Remember that Termidor is an outdoor chemical. Don't use Termidor indoors except for spot treatments in areas sealed away from contact, such as inside a closed wall space. Always read the container label carefully for particular first aid and safety instructions, and don't use the chemical for purposes not listed on the label. The label is a legal document, and using the chemical for off-label purposes is illegal. In some cases, it's a felony. Avoid letting any of the diluted or undiluted chemical run or drift into a waterway, as it is particularly dangerous to amphibians and fish. You could also inadvertently expose pets and people who come in contact with waterways or gutters. Do not use the product near a water well or within a foot of the drip line around edible plants. 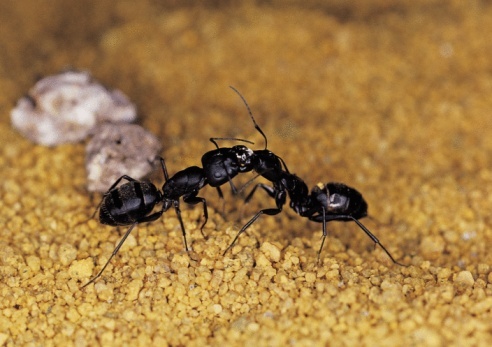 The active ingredient in Termidor is not an immediate knockdown chemical, so insects that travel through it have time to share bits of it as they make contact with other nest members. They do this quite often, so Termidor has an excellent chance of killing all the members of a termite community, including the queen and the young. Subterranean termites can't abide sunlight and must have a humid environment to thrive. Thus, they travel only underground, accessing your wood structures from below via mud tubes they construct when it's dark and cool. In order for the termites to come in contact with the Termidor, then, the chemical needs to go where they are likely to pass through it: in the soil around and under your home. The recommended method for applying Termidor is to pour it into a ditch 6 inches deep and 6 inches wide all around the perimeter of your house. Dig this ditch right up against the foundation. In order to ensure an even application, leave little dirt walls in the trench at 10-foot intervals to create a series of long, skinny pools. Mix 0.8 ounce of Termidor suspended concentrate per every gallon of water in a bucket and fill each 10-foot section with 4 gallons of solution. Double-check the label for dilution rates, as formulations are sometimes changed by the manufacturer. When the material has soaked into the ground, back-fill the ditch. If a concrete driveway or sidewalk slab interrupts your perimeter barrier, use a concrete drill to punch holes through to the soil beneath. Follow up by pouring the appropriate amount of solution into the holes using a funnel. This could take some patience, as the compacted soil beneath the slab may be slow to soak it up. Clean all tools and the bucket thoroughly with soap and water when you're done.